during this event. Happy Haunting! Last Friday I went to the Halloween Social. It was super fun! 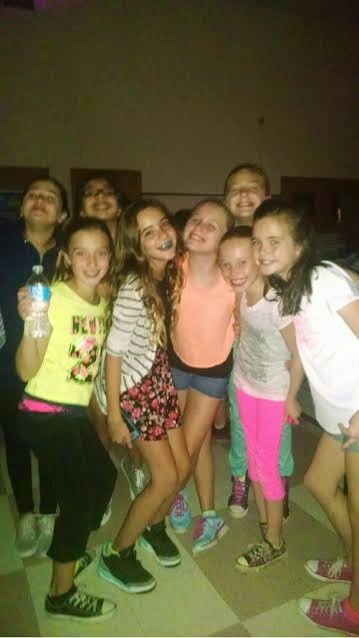 The party was for 5th and 6th graders. The admission was $5 and you got a ticket to go in. Drinks and snacks were included in your fee. It was held in the Island Trees Memorial Middle School cafeteria. 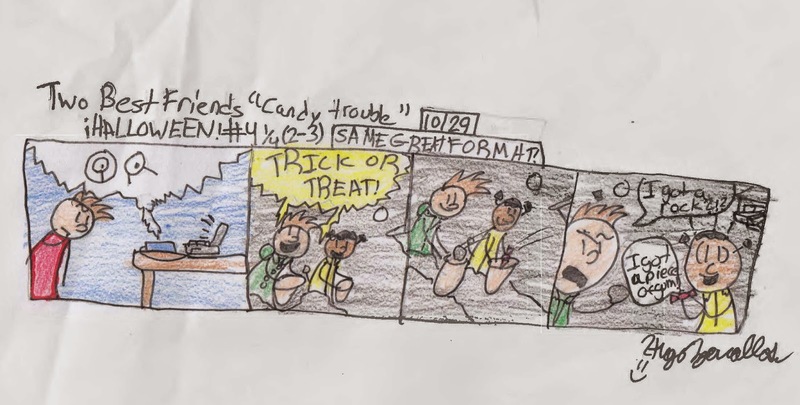 During 9th period there was an announcement held to tell all the 5th and 6th graders to get their costumes on. My costume was the Queen of Hearts from Alice in Wonderland. When you walked into the cafeteria there were streamers hanging from the door and inside there were cobwebs and skeletons. There were also student helpers helping with the food and drinks and walking around to make sure things were set as planned. I danced and hung around my friends and had a great time. There was a hula hoop contest too. We also had singing contests that the DJ hosted. I had such a great time. If your in 5th grade and didn't go this year, I suggest you check it out next year! I know Halloween is coming up, so here are some houses were you can not only get candy, but get scared, too. Bill doesn’t just set up his house, he dresses up too! I earlier years Bill has been the Wolfman and a space alien, but now those costumes are part of the setup on his lawn. I can’t tell you what he is going to be this year, so I guess you’ll have to go there and find out on October 31. A few blocks away in Hicksville, on Barrister Road, there is a house called “Ye Olde Bone Yard”. In the garage is a rock band of skeletons. On his lawn he has a pirate ship filled with skeletons like the zombies from “Pirates of the Caribbean”. On his porch he has famous movie monsters, like Leatherface, Frankenstein, and Freddie Kruger. Driving around, I noticed that a lot of houses have started decorating with orange lights, like the red and green lights at Christmas. These seem to be getting more popular. In past years there were more houses that went all out like the first two I mentioned. Even though there are less of the really good ones, the houses that I mentioned are worth taking a look at. Hope you enjoy your Halloween, and you get a nice scare! 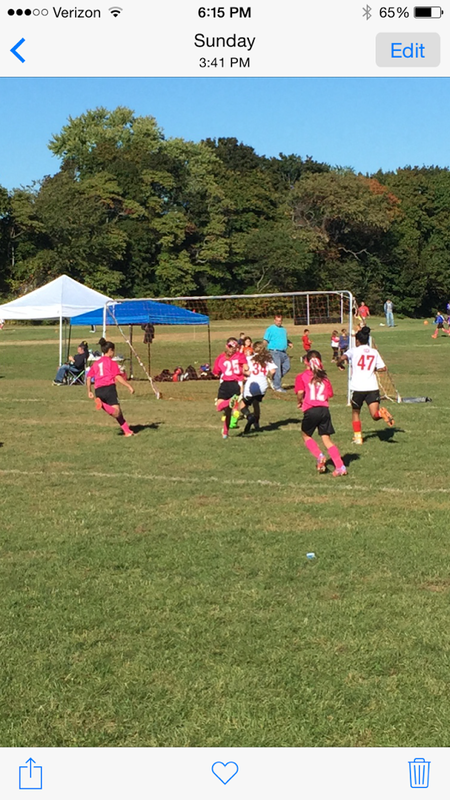 Last weekend, the Island Trees Storm attended the Northport Cow Harbor Columbus Day Tournament. We came in 3rd place out of all of the teams that attended! We played two games on Saturday, and two games on Sunday. The first team that we played on Saturday was Brooklyn AYSO United. We tied the game. The final score was 1 - 1. Elena Passini scored the goal. The team that we played second was The Northport Cow Harbor Dolphins. We won the game! The final score of the game was 4 - 3. Elena Passini scored the first two goals, Caroline Meyer scored the third goal, and me, Alyssa Sandez, scored the winning goal of the game. On Sunday, we played another two games. 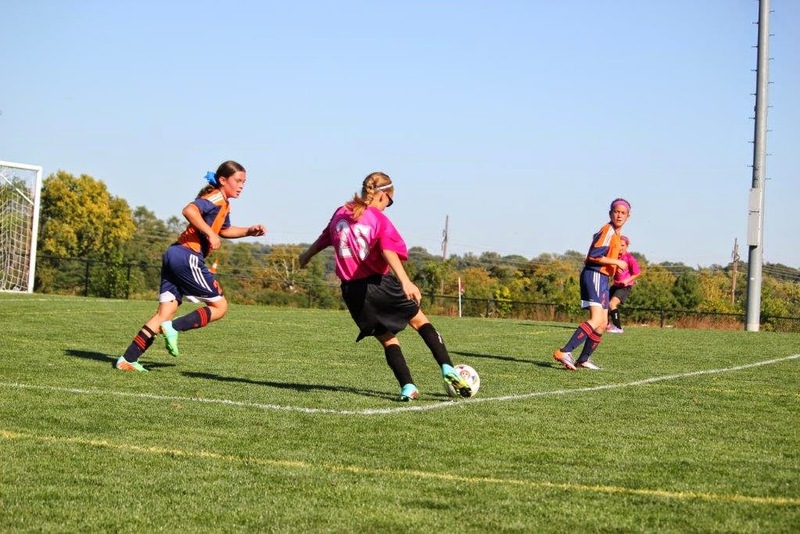 The first team that we played against on Sunday was Franklin Square United. The final score to the game was 1 - 1. Elena Passini scored the one and only goal of the game. Manhattan Sting. We won the game. The final score of the game was 3 - 0. The first goal was scored by Elena Passini. The second goal was scored by Megan Cosgrove. The third goal was scored by me, Alyssa Sandez. 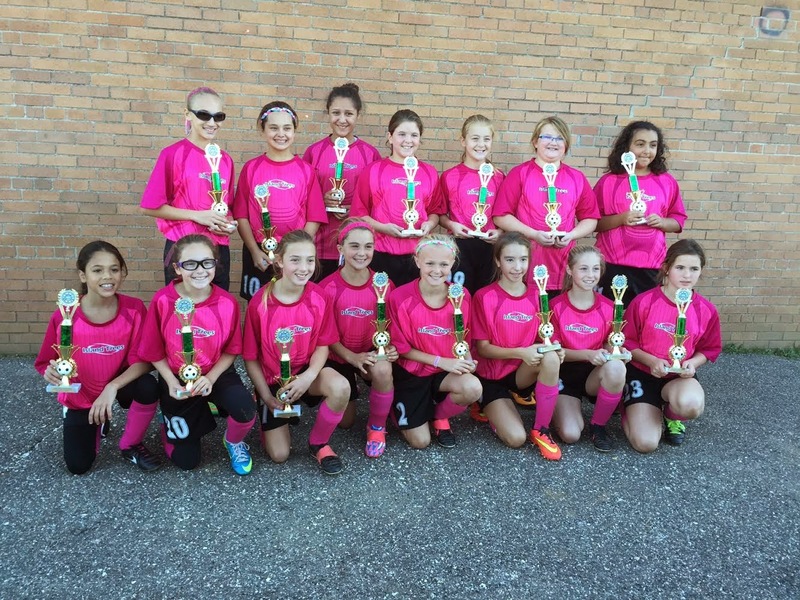 The Island Trees Storm had an awesome weekend, finishing in 3rd place in the Columbus Day Soccer Tournament. We are very thankful to have participated. We are very proud of each other, and we cannot wait until our next game! 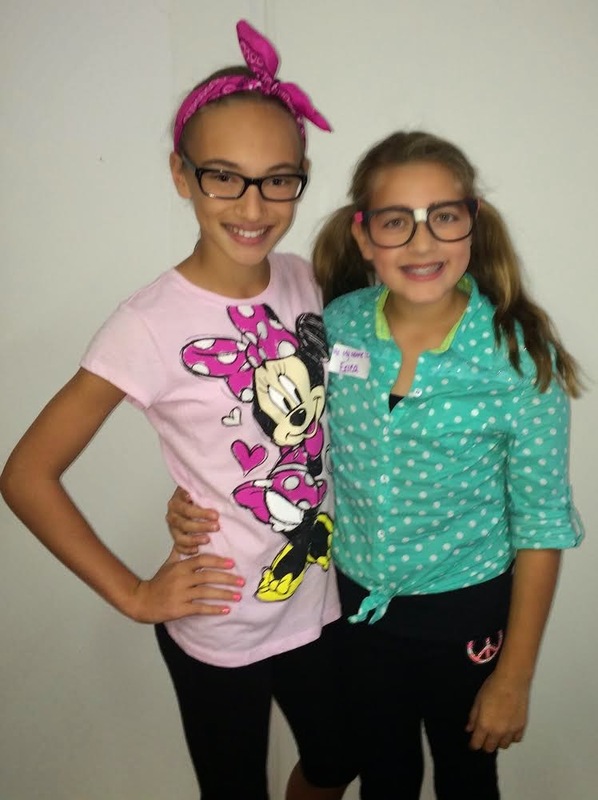 This years spirit week was a fun time for students and teachers. Monday was Favorite Team Day. Many students went all out: painted faces, jerseys, hats, socks, even shoes. 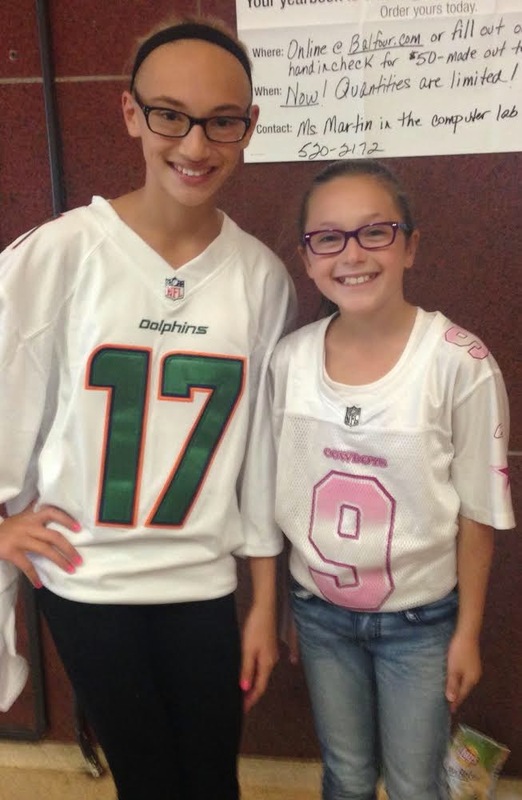 We now know that kids and teachers are supportive of their favorite teams. Tuesday was Red and White day. Students and teachers went all out showing spirit for the school. Also, our pep rally was on Tuesday. The 7th and 8th grade band did a great job preforming their pep music. They prepared very hard and we cant wait for their concert this winter. All the students had a wonderful time. On Wednesday it was Character Day. Students and teachers dressed up as their favorite characters from books and movies. There were many students and teachers that participated. Thursday was Tropical Thursday. 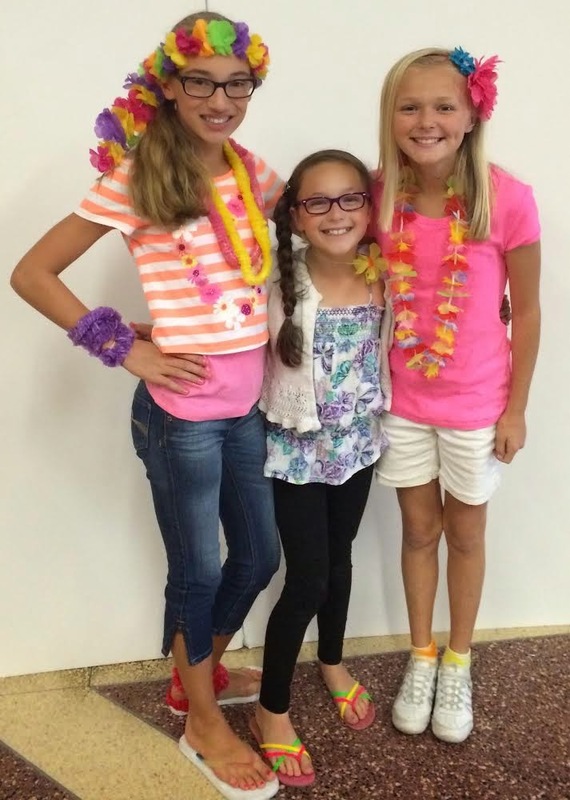 Many students and staff showed off their grass skirt and their flower necklaces. Students had fun posing for pictures for our school year book. 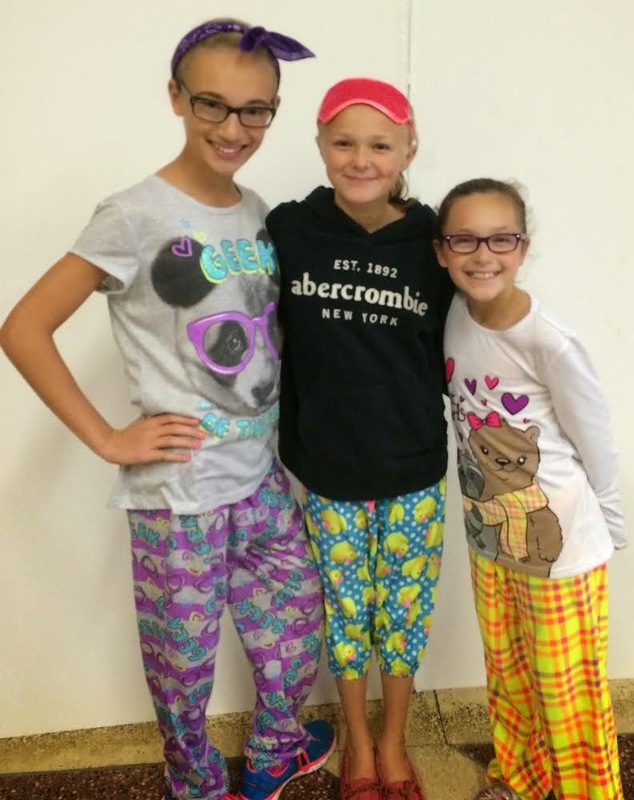 Friday was Pajama Day, everyone showed off the comfortable pajamas. Some wore their slippers, held their stuffed animals, and wore their footie pajamas. Our teachers who showed the most school spirit was Mr. Cava and Mrs. Bunster. Congrats! And Go Bulldogs! This Tuesday was our pep rally. Pep rally is for school spirit. We wore red and white. It also is to support the teams. It was really fun! At the end of the day we all went into the gym. There was balloons everywhere. Eighth graders were throwing the balloons to all of us in the audience. A few of my friends Alyssa, Anthony, and Christina, caught a balloon. After everyone was settled they started to announce the seventh and eighth grade sports teams. Then they told us who out of Mr. Burns or Dr. Bloom that would do the ALS ice bucket challenge. It ended up being Dr. Bloom. He was drenched in ice water! It was very cool to watch. It ended also with Mr. Burns getting wet too because they said he only raised $5. It was such a great first pep rally for me. Yearbook Available for ALL GRADES! What is so cool about the yearbook is that it has EVERY grade in it. There are so many sections like Halloween, Spirit Week, the Pep Rally, Sports Night, Clubs, Art, Music Workshop, Gym, and so much more. Each grade gets their own section, too! It's not just for the 8th grade, anyone could have it. You may see yourself or your friends in it too. So go buy yourself a yearbook and in the end of the year, laugh about all the memories you remembered with your friends and fellow classmates. Keep one for every year that you are in the middle school and cherish those memories! Contact Maureen Martin in the computer room for more information. 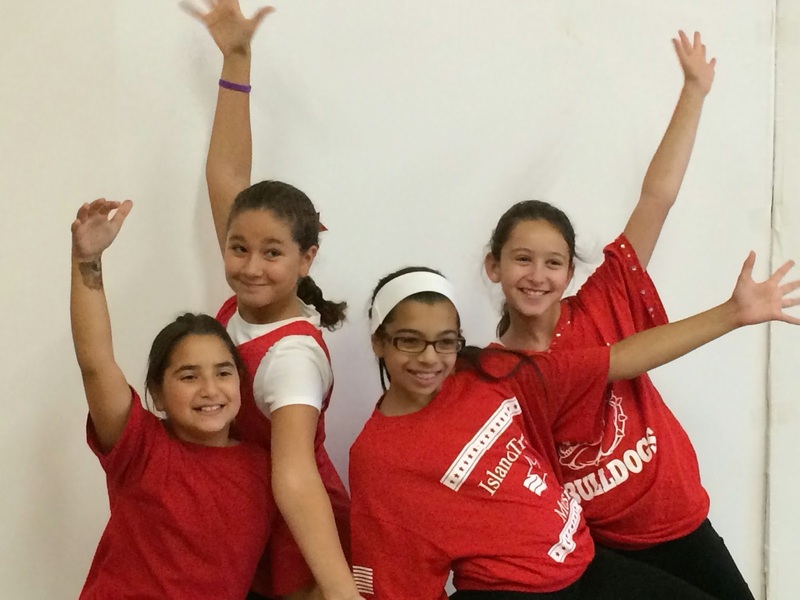 There was an explosion of red and white in the gym on October 7, 2014. It was the Pep Rally for Island Trees Memorial Middle School. At the Pep Rally many fun events took place. There were a bunch of red and white balloons, tiny “Number One!” fingers and pompoms flying through the air. The Pep Rally began with the IT soccer team players names being announced and they got to run across the gym. Then, the boy’s football team was announced. The football players got to show off their skills by playing a quick 2 minute game. Minutes later the ice bucket challenge took place. Dr. Bloom and Mr. Burns participated. As they sat in chairs about to get dumped with freezing cold water; the whole school chanted two words, “Do it!” Dr. Bloom and Mr. Burns had to sit in kiddy pools and they got a freezing cold bucket of water poured over their heads. The whole school raised a total of four hundred dollars for the ice bucket challenge. All together over 115 million Americans raised money for the A.L.S Ice Bucket Challenge. The money Island Trees raised is going to research for A.L.S and is going to be added to the A.L.S Ice Bucket Challenge Donations. 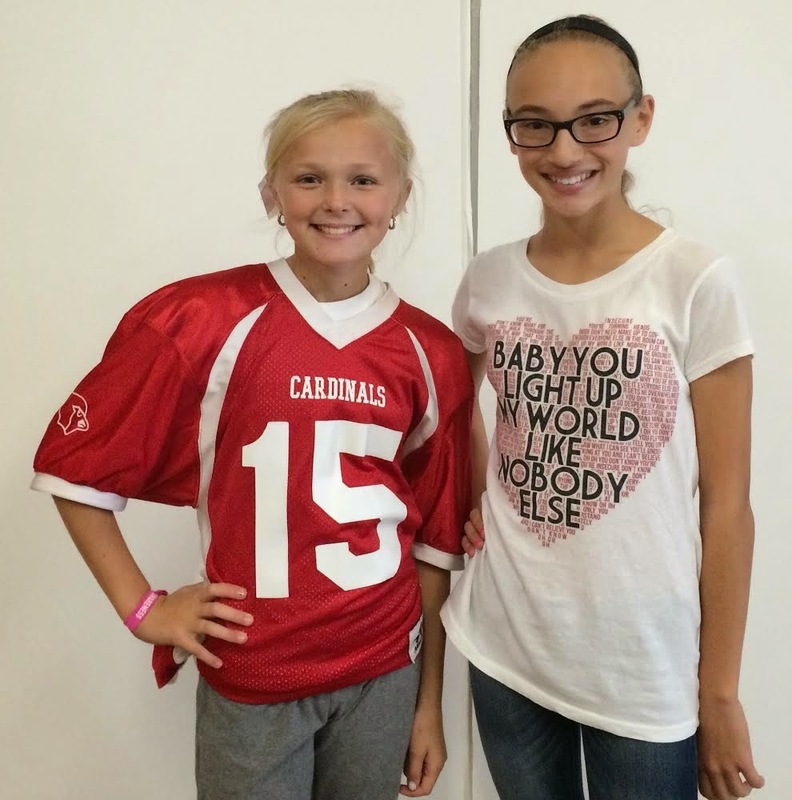 Most kids dressed in red and white to show school spirit. The Pep Rally was so much fun and kids from 5th grade through 8th grade enjoyed it. The Pep Rally was a time to root for our school and have some school spirit! On October 2, 2014, Island Trees had their fifth Pink Out. The previous coach started this tradition five years ago. Island Trees head coach Tom McCormick, still carries on this tradition. The Pink Out is part of a football game where players wear pink colors and it is also for the American Cancer Society. Island Trees raised $500 to $1,000 dollars this year! The money raised was used for Breast Cancer Research. Many people were at the Pink Out and had a wonderful time. The Pink Out was an event that only Island Trees participated in. Unfortunately, the other team forgot it was Pink Out and wore their regular uniforms. During the first quarter, East Rockaway lead the Bulldogs by the score of 14-6. At half time, East Rockaway lead the Bulldogs 22-6. At the end of the third quarter, the Bulldogs started to catch up with East Rockaway leading the Bulldogs 22-20. When time ran out East Rockaway was ahead of the Bulldogs by 2 points. The score was 36-34. The Bulldogs gave it their best but lost. Coach McCormick said “I have a sister that is a Breast Cancer survivor.” Each year this event will take place. If you enjoyed the Pink Out, Island Trees will be having a Breast Cancer Walk on October 19th, 2014. Even though the Island Trees Bulldogs lost the game, everyone still had a great time and the real winners are the Breast Cancer survivors and their families. May God bless them. Coach McCormick and his daughter Madison McCormick helped make this beautiful sign with cups. 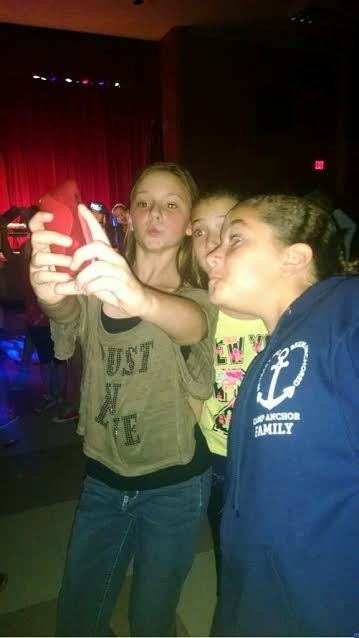 CAPIT is a great socialization time for kids. 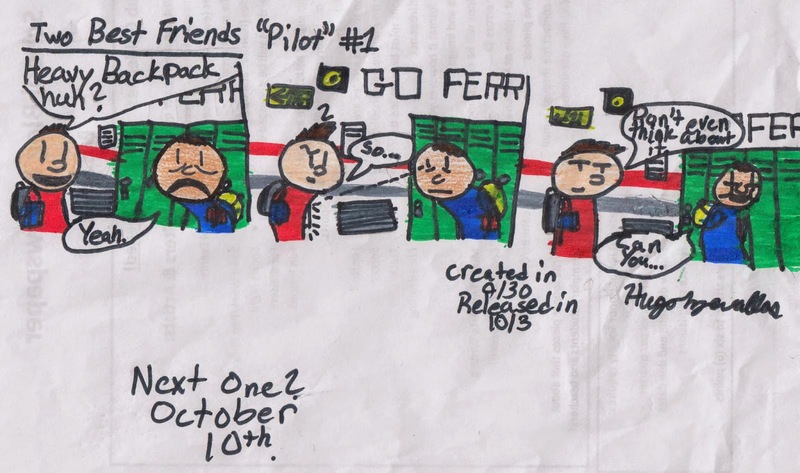 It was on Friday, October 3, 2014. Kids get to run around and dance. It takes place in the Island Trees Middle School and is the first Friday of every month. It’s so much fun to hang out there, and then after have your friends come over. Parents can take kids to different places. I personally love this idea. The only drawback is that the parents have to watch all the kids. Below are some pictures to show what goes on there. One thing you can do is dance in the cafeteria where there will be a DJ. You can request songs for he/she should play. In the cafeteria there is also a food stand that you can buy ring pops, sour patch kids, sprite, etc. Another place you can go to is the little gym. In there you can play basketball. You can also play basketball and hangout on the stage in the big gym. The last place you can go is the computer room. You can finish your essays for school or play a game. I hope one day if you are a 5-8 grader, you go to the Island Trees CAPIT and check this program out. Holy Trinity's Basketball Season Ended with a Horrible 0-12 Season, Hopes to Bounce Back Stronger. 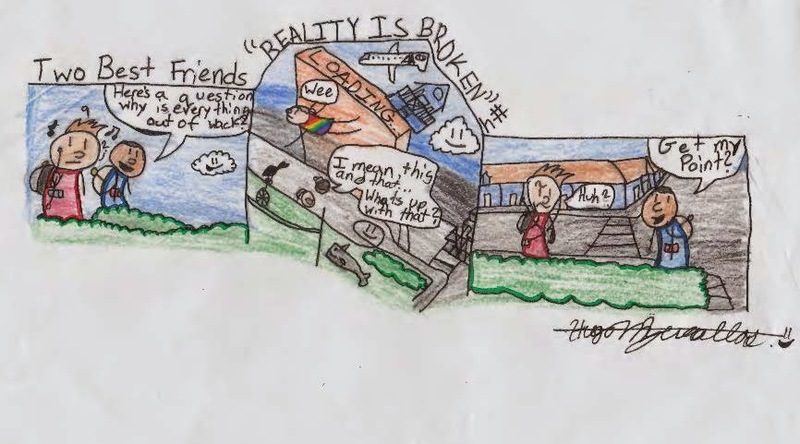 Ian writes of his experience on the Holy Trinity basketball team located in Hicksville, New York. This year, he hopes that they will come back stronger. The last game of Trinity's last season made it official: they went all defeated. No wins, all losses. They hope to make a major comeback this upcoming season. 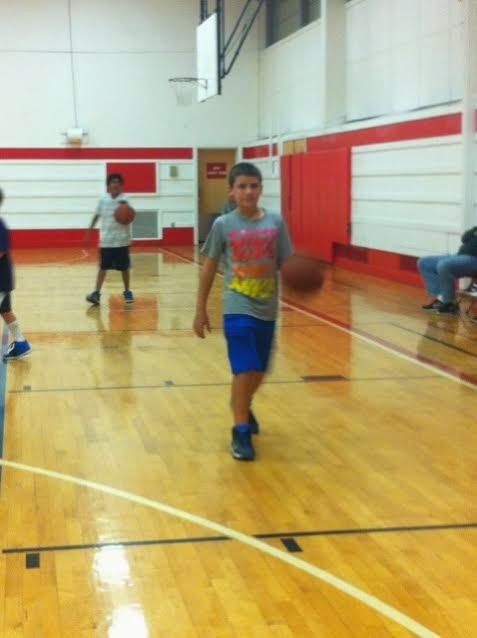 This season, they will most likely lose the 6th grader big man, Ricky Petralia. He was a big help on defense, a solid player who was able to get rebounds for Trinity. He was able to make short-range shots, and was decent from mid-range. I'm not gonna lie to you-Trinity's game was kind of ugly. They lost most of their games by a wide margin. Very few games were even within a 10 point difference, which is still pretty bad. I (Ian Silverstein), starting small forward, want to lead the team to victory. I was once nicknamed the "rebound machine", because I was able to get boards. I can still do it. I'm not going to make myself sound like LeBron James now, because I am not THAT good. But, I can shoot mid-range shots, and get rebounds. Plus, I will make a 3-pointer every once in a while. But the reason I feel like I can lead the team to victory is because of my attitude. In fact, I only averaged 2 points a game that season. I feel like I have the attitude to take control of a team. When I'm on the court, or even on the bench, I feel like a coach, telling each other to communicate better and stuff like that. My goal this year: to make sure the team doesn't lose more than 7 games. I have a good team with me to achieve that goal. My fellow teammate, Kenneth, is a player who reminds me of Amar'e Stoudemire because he has a nice game, but not the BEST game you'll ever see. I'm kinda like that, too. I'm no Jordan, but I'm also no Scalabrine. That's also how Kenneth is, and a few of my other teammates. We are a solid team, and we can make the playoffs this season if we put 110% effort into every single game and practice. All I can say is that I'm really pumped for this season, and I can't wait to see how the team and I do this season. 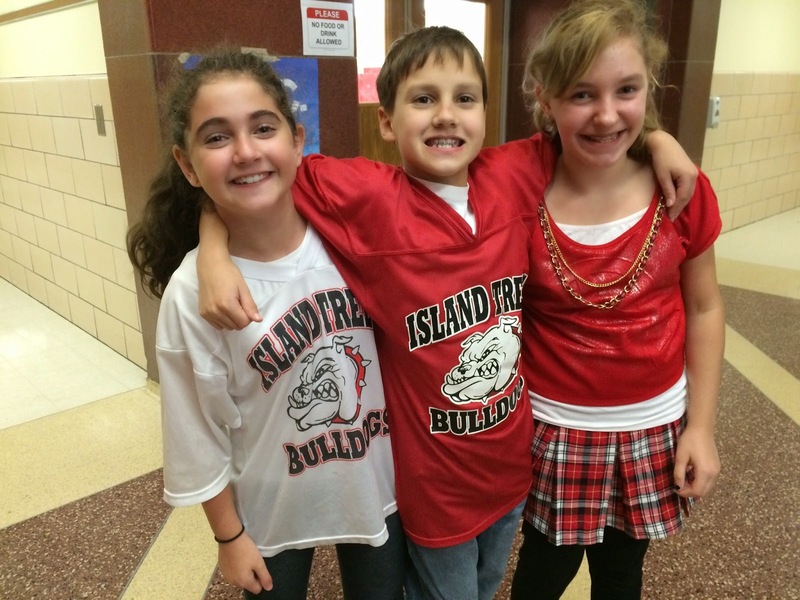 Spirit Week kicks off Monday, October 6th for the Island Trees Memorial Middle School. The Student Leaders have announced the themes for each day. Make sure to dress everyday and show your school spirit! Monday: Sports Team Jersey Day-Wear your favorite team's gear! 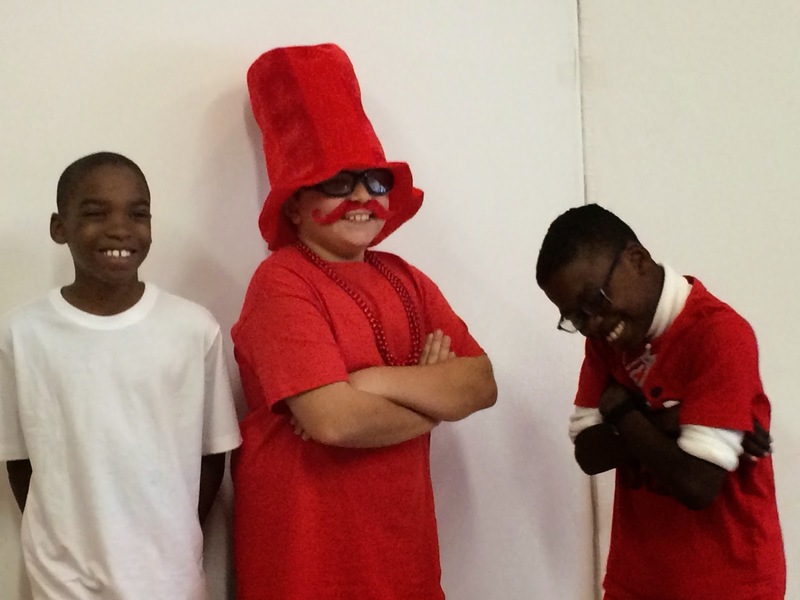 Tuesday: Red and White Day-Wear head-to-toe red and white for our MMS pep rally! Support our teams!! Wednesday: Character Day-Have you ever dreamed of being a Disney princess? Ever imagined yourself flying high in the sky like Superman? What about Harry Potter? Don't you love that cape? Well, now's your chance to live out those dreams! Pick your favorite character from history, literlature, comic books, TV and movies! Thursday: Tropical Thursday-Wish you were on a tropical island? Long live summer! Dust off those Hawaiian shirts, grass skirts and colorful leis! Friday: Pajama Day-Get comfy-cozy in your flannel PJ's! No dozing off during school! Since 2012, the Island Trees Memorial Middle School has been highlighting words every week that belong to an academic vocabulary list. These words are used repeatedly across subject and curriculum. Teachers use these academic vocabulary words in their lessons and activities in order to promote a better understanding. a feeling of excitement about something that is going to happen; the act of preparing for something. Exhibition (n): an act of showing some quality or trait; an event at which objects (such as works of art) are put out in a public space for people to look at. the way you think about or understand someone or something; the ability to understand or notice something easily. to form ideas or theories about something usually when there are many things not known about it. Over fifty students from the Island Trees High School National Honor Society and the Memorial Middle School National Junior Honor Society joined together to participate in the annual "Step-Out Walk to End Diabetes." Held on Sunday, September 28, 2014, students and staff from both schools completed the five mile walk along the Boardwalk at Jones Beach. We are proud that both groups raised over $5,00.00. Thank you to Mrs. Nieves, advisor to the ITMMS NJHS and members of both honor societies who joined in the walk, and the staff, families and friends that helped support a very important cause. Pictured in the photos are both honor societies, as well as 8th graders Madison Tierney and Ryan Costanza, the two top fundraising students. Great job! The National Association for Music Educators (NAFME) is one the world's largest music and arts education organizations and is the only association that addresses all aspects of music education. NAFME provides resources for educators, parents, and students and works to ensure that every student has access to a well-balanced and high-quality music and arts instructional program. NAFME's resources and activities are largely responsible for the development of National Standards for Arts Education. Each month NAFME names one prestigious educator in the United States as the online Music Composition Mentor. We are proud to announce that our very own Mr. J. Peter Hansen, music teacher in the Island Trees Memorial Middle School and Island Trees High School, has been named the NAFME online Music Composition Mentor for the month of September. This is a great honor for Mr. Hansen as continues his endeavor to promote the thought that music composition can be included in all music classroom environments. As the online Music Composition Mentor for the month of September, Mr. Hansen will be working with other music educators in the United States to work towards getting groups of students involved in the composition process. ITMMS Bringing Smiles... One Pillow Case At-A-Time! Many of our staff members are involved in the ConKerr Organization that makes and delivers bright and colorful pillowcases to hospitals for children facing long term illnesses. On Friday, September 12, 2014, students and staff of the Island Trees Memorial Middle School gathered to sew 82 Halloween-themed pillow cases to be donated to four local hospitals and two pediatric cancer centers. During the fall season, ConKerr will deliver the pillow cases to hospitals and it is our goal that these creations will brighten the day of these children. We thank the students and teachers for participating in this fantastic and important community service project. Thank you to Mrs. Samantha Bunster for working with the ConKerr Organization to have these 82 pillow cases delivered to children's hospitals. We look forward to doing this activity again with our students and staff and brightening the lives of children who are suffering from long term illnesses.